This workshop moved to May 19 & 21! 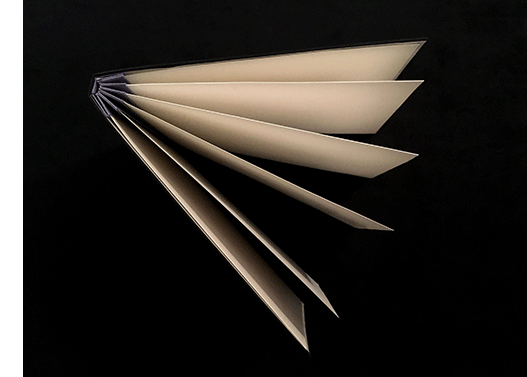 If you’d like to make a beautiful book that allows you to showcase individual pieces of art, or a collection of photographs, this portfolio album is the perfect way to instantly assemble your work — the album’s unique spine pockets allow you to slip in your work with ease. This workshop has two sessions: a full weekend day, and a weekday evening. We will first make the cover with traditional bookbinding techniques (wrapped boards with paper-backed linen fabric, and Japanese decorative paper endsheets). We will then construct the intricate interior spine with an almost origami-like paper folding that is a marvel to see unfold (by folding!). Lastly, we will marry the two, and insert our artwork. The album size is 8” x 10”. Please bring 7 individual leaves of artwork or photographs to the workshop if you can, to walk away with your “instant” portfolio album, and an opportunity to have a mini-exhibition of our newly made books. Facilitator: Derek Bacchus is a publishing consultant, creative director, designer, photographer, educator, and bookbinder. He has been a magazine art director for a number of titles, including the Wine Spectator, a book publishing design director at Allworth Press, and most recently Chief Product Officer and Publisher at the children’s edtech startup, Know Yourself, in downtown Oakland. He taught for nearly twenty years, including design history at Parsons School of Design and The Cooper Union (New York); 2-D Design, Information Design and a Senior Seminar in Alphabets and Books at Cooper Union; and bookbinding at the Pont-Aven School of Art in Brittany, France. He has design degrees from Parsons School of Design, and The Yale School of Art.